This Demonstration calculates the Thomas precession induced when a point in constant-speed motion is transported around a spherical triangle on the sphere of constant , where is the Lorentz factor. The sphere represents the directions of velocity vectors at constant speed (constant ). The spherical triangle is defined by the north pole and two other points with colatitude and longitude coordinates and . This represents a cycle of motion at constant speed. You can change , , , to move the spherical triangle, which is plotted on the surface of the constant-speed sphere. The Thomas precession of the coordinate frame induced by transport around the loop is then shown as green, blue, and purple coordinate frames. Snapshot 1 shows the Thomas precession around a loop with (i.e. when the speed is ). In this case, the holonomy group induced by Thomas precession is trivial, just as it is when (nonrelativistic motion) and Thomas precession induced by torque-free motion state transport on the sphere's surface is path independent. Snapshot 2 shows the case (i.e. when the speed is ), when the holonomy group collapses to the group of rotations about the lone axis defined by the initial velocity direction. The case is, of course, still trivial. At all other values of (i.e. ), the holonomy group is the whole of . 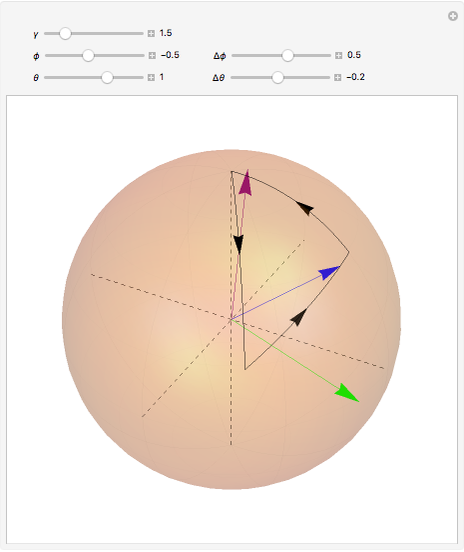 Snapshot 3 shows the case, when there is a large rotation of the coordinate frame induced by Thomas precession arising from motion state transport around the spherical triangle. C. W. Misner, K. S. Thorne, and J. A. Wheeler, Gravitation, San Francisco: W. H. Freeman, 1973 Section 6.6. A. Dragan and T. Odrzygóźdź, "A Half-Page Derivation of the Thomas Precession," American Journal of Physics, 81(631), 2013 p. 631–632. doi:10.1119/1.4807564. Rod Vance "Induced Holonomy Groups for Thomas Precession on a Sphere"